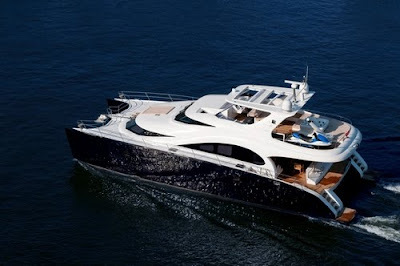 The luxurious 2009 Damark II is available this summer for charter in West Mediterranean. The impressive full-beam master cabin with over 180-degree view through the bow-facing windows, includes a large en-suite bathroom with separate shower in one hull and dressing room in the other. There are also generous-sized 2 queen cabins and 1 king cabin – all with en-suite bathrooms. The salon with galley, equipped with high-end Bose home cinema and 40' plasma screen, with large dining table is the perfect place for entertaining guests and enjoying all yachts luxuries. The full-beam enormous flybridge shaded by the bimini includes jacuzzi flanked with sunbeds, bar and a large dining table. The Damrak's interior is a great example of a modern, elegant and clean style with wenge veneer furniture and light-beige alcantara upholstery. The recreation equipment includes jet tender with 125 hp engine, 2 Seabob underwater scooters and full diving equipment, making her the perfect charter.